Sweet charred pineapple paired with creamy mozzarella cheese, with a hint of rosemary and chilli. 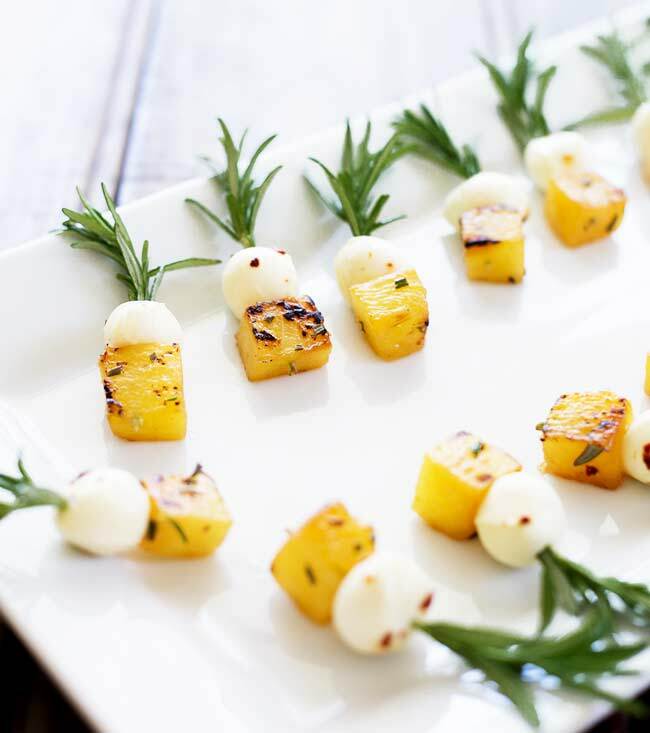 These Rosemary Pineapple Mozzarella Bites make the perfect one bite, prepare ahead, canapé! You’ll just love this up to date cheese and pineapple combo! I just love these Rosemary Pineapple Mozzarella Bites. They are the grown up version of cheese and pineapple! Do you remember that retro party staple? A cube of cheese, a chunk of pineapple all served on a cocktail stick and then served on a foil covered half potato. Oh cheese and pineapple sticks were a childhood favourite!!! I don’t remember a birthday party without them. 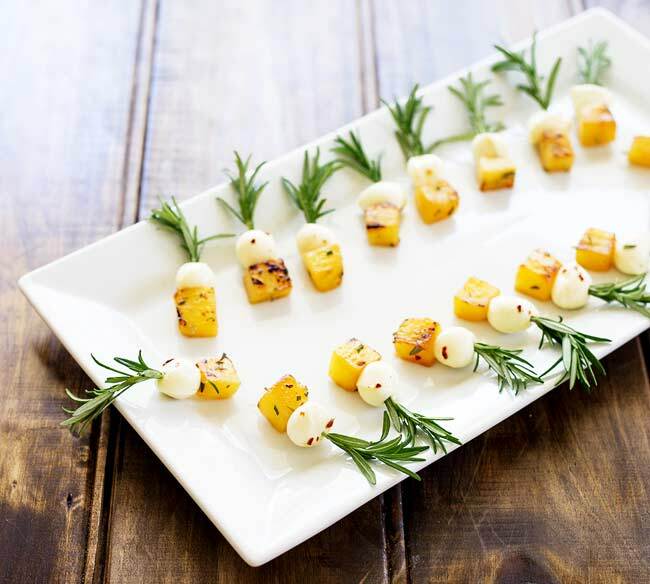 But a couple of years ago I decided to drag cheese and pineapple back up to date with these Rosemary Pineapple Mozzarella Bites. The pineapple is lightly charred and then marinated in rosemary oil, the mini mozzarella balls are dressed with a spicy chilli/red pepper oil. Then everything is skewered together. The resulting nibble is a sweet and spicy bite that is perfect for eating with one hand. If you haven’t charred pineapple before then you are in for a treat. It is sweet, juicy and smoky. I think all canapés should be easy to eat. Think about it, your throw a a party, your guests have a glass of wine, everyone is chatting and someone reaches for a canapé and suddenly they need a plate. They have to put their wine down, hold their plate, eat their food and find there wine again. And who wants to put their wine down at a party?? Nope That is not how I rock it at Sprinkles and Sprouts parties!!! For me a party and the key to easy entertaining is to have some delicious food, some happy guests and plenty of laughter. 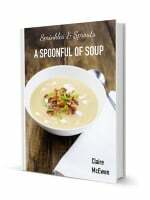 So serve single mouthful or skewered foods, that leave guests free to keep their glass in hand. And these Rosemary Pineapple Mozzarella Bites hit both of those!!! Skewered on natural cocktail sticks, made from my rosemary bush or a standard cocktail stick. They are easy to eat, super pretty to look at and can be made in advance! As I always say a prepare ahead canapé is an easy canapé and an easy canapés make for a stress free party. And that is what I am all about, stress free entertaining! These Rosemary Pineapple Mozzarella Bites first appeared on Cook, Craft, Love. 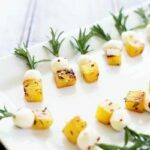 If you love this recipe for Rosemary Pineapple Mozzarella Bites why not pin it for later. 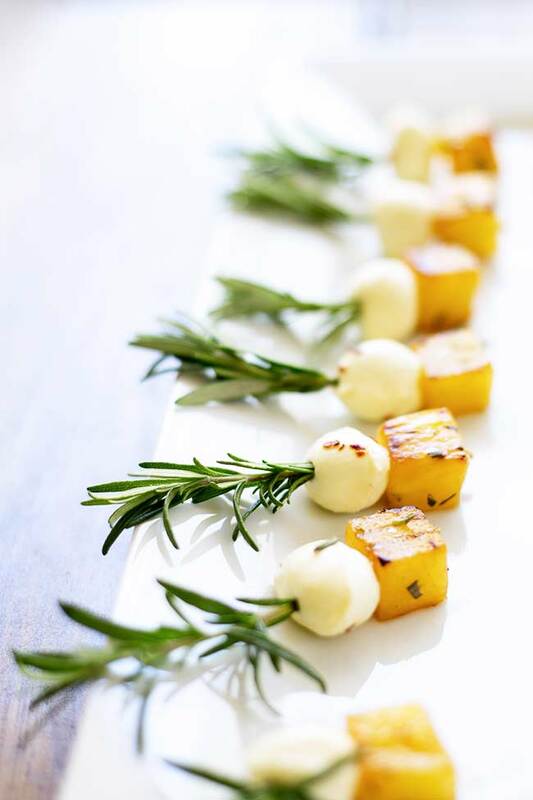 Sweet charred pineapple paired with creamy mozzarella cheese, with a hint of rosemary and chilli. 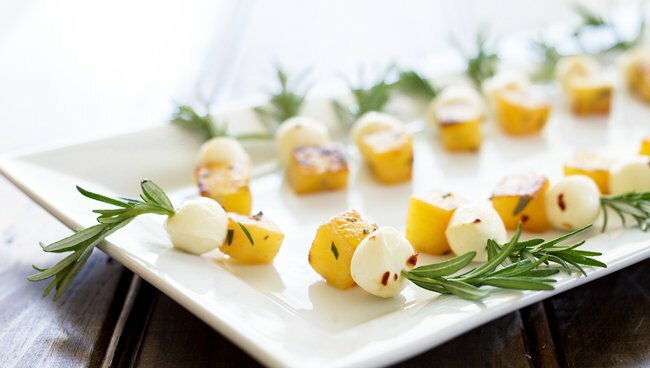 These Rosemary Pineapple Mozzarella Bites make the perfect one bite, prepare ahead, canapé! You'll just love this up to date cheese and pineapple combo! Pour the olive oil into a cold frying pan, add the rosemary and place over a low heat. Let the oil to heat up and as soon it starts to shimmer, remove from the heat and pour the oil into a heatproof bowl. Set aside. Place the drained mozzarella balls into a separate bowl and sprinkles over the red pepper flakes. Shake gently to ensure each ball has a little chili on it, then set aside. Place your frying pan back on a high heat (no need to wash it) and add the pineapple chunks in a single layer. Cook over a high heat for 2 minutes then flip and cook on the other side for a further 2 minutes. Remove the pineapple from the pan and add to the and add the pineapple into the warm rosemary oil. Set aside and allow to cool. Take your cocktail stick (or branch) and push on a baby mozzarella ball. Add a chunk of pineapple and set onto a platter. Cover and keep chilled until your party. Remove them from the fridge at least 15 minutes before you want to eat them. 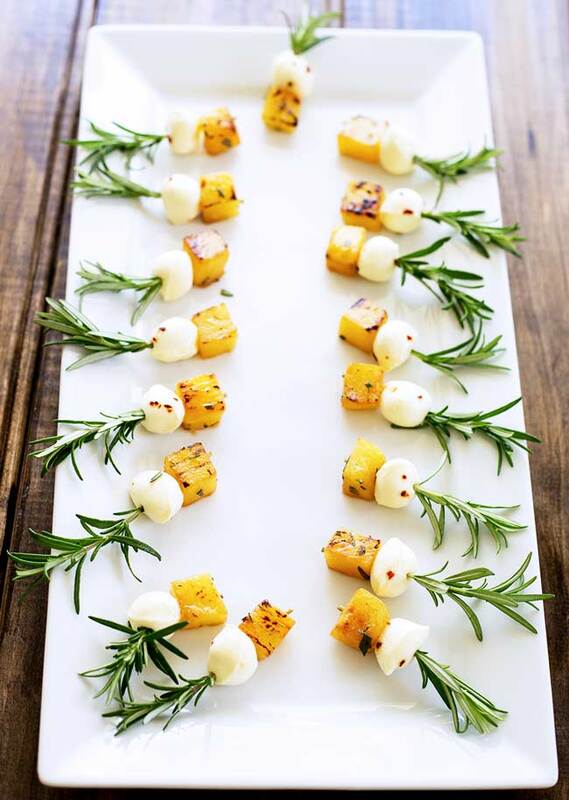 If you love food why not subscribe to my newsletter, I will drop you an email every now and then, just to say hi and send you a couple of recipes think you might love, like these Rosemary Pineapple Mozzarella Bites. What a beautiful little appetizer! I bet the salty cheese with the sweet pineapple is a heavenly bite! They are so doggone cute. Every year we plant a rosemary bush and we have lots of rosemary sprigs. I can’t wait to make these darling appetizers. Love them, so creative! Pinned! These are too cute 🙂 Great idea!